Review: Technically, Flying Lessons is a middle grade book, not young adult, but my love for these stories overruled small technicalities like that. I was so excited when I first heard that this anthology was coming out, and I’m happy to say that Flying Lessons more than lived up to my expectations. My favorite stories were “How to Transform an Everyday, Ordinary Hoop Court into a Place of Higher Learning and You at the Podium” by Matt de la Peña (a thoughtful account of a summer at a new basketball court and the lessons learned there), “The Difficult Path” by Grace Lin (a fun story starring a servant girl who has an encounter with famous pirates—I’d love a full book on this one), and “Secret Samantha” by Tim Federle (one of the cutest first crush stories I’ve read in ages). The other seven stories are also very good, and they span a wide range of topics, styles, and tones. Some stories are more serious (dealing with the death of a parent or trying to navigate some nasty microagressions), while others are more lighthearted (a story-within-a-story about a family’s encounter with the Naloosha Chitto, the Choctaw equivalent of Bigfoot). While I love “The Difficult Path,” it does feel strikingly out of place as the only story in this anthology that wasn’t set in the present day. Since it was the second story in the book, it made me think we were going to get more non-present-day stories (e.g., historical, fantasy, sci-fi, etc. ), but I was disappointed when that never happened. I would love to see another anthology like this with more non-contemporary titles and with even more kinds of representation. Recommendation: Get it soon, particularly if you enjoy middle grade fiction! 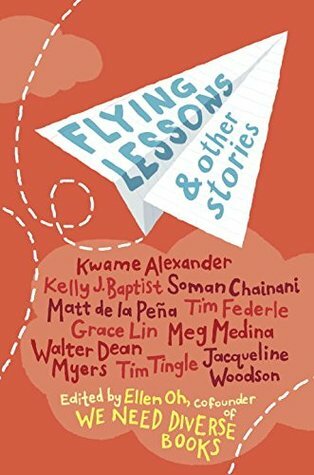 Flying Lessons is a thoughtfully compiled anthology that strove to be as inclusive as possible, and it mostly achieved its goal to celebrate diverse voices.